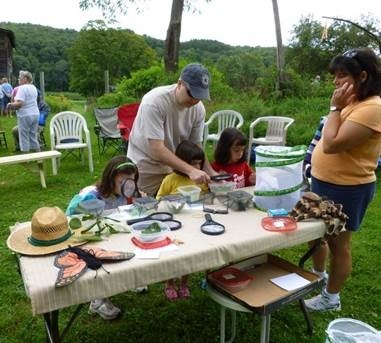 LIBERTY, NY (July 31, 2014) – Join the Delaware Highlands Conservancy, Cornell Cooperative Extension Sullivan County (CCESC), and naturalist Ed Wesely for a Monarch Butterfly Program at the CCESC office in Liberty, NY on Saturday, August 23 from 10:00 a.m. – 12:00 p.m.
For twenty years, Ed Wesely and Barbara Yeaman rescued Monarch butterfly eggs and caterpillars from threatened habitats, reared, and released them. With the help of local school children, they nurtured and released over 6,000 adult monarchs. Learn about the monarch life cycle, its migration to Mexico, and the threats to the monarch butterfly population and habitat. This is a program for the whole family to enjoy. This event is free and open to the public, but space is limited and prior registration is required. The CCESC office is located at 64 Ferndale Loomis Rd, Liberty, NY. To register, call the Delaware Highlands Conservancy at 570-226-3164 or 845-583-1010, email info@delawarehighlands.org, or visit www.DelawareHighlands.org.